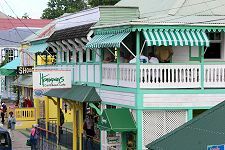 Hemingway’s is located in the traditional green and white wooden building overlooking St. Mary’s Street and Redcliffe Quay in St. John’s – Antigua’s capital. This West Indian styled wooden structure was once a well known hotel called Jardine’s. 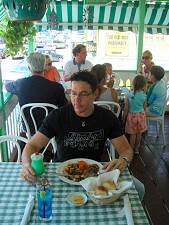 Built in the early 1800’s it is a perfect example of the kind of place frequented by the celebrated author. Our cool verandah terrace overlooks the street and is an ideal place to have a drink or something to eat while shopping or waiting for your taxi. 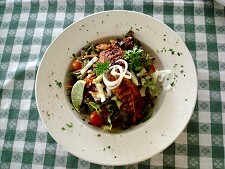 For lunch, choose from soups, salads, sandwiches and island seafood specialties, including local lobster. In the evening, the best Creole Cuisine, fresh Caribbean seafood dishes and choice US steaks are available. We offer daily lunch and dinner specials and an excellent wine list with friendly and attentive staff. We have the most extensive and exotic Caribbean Rum collection in Antigua and a wide selection of tropical drinks with thirst quenchers such as Hemingway’s Fruit Punch and Pineapple Daiquiri (made with local pineapples and rum). After dinner, for those wishing some nightlife there is a casino, bars and other entertainment venues close by, just ask. US Cash and Travelers Cheques accepted and US change given. We also accept major credit cards. 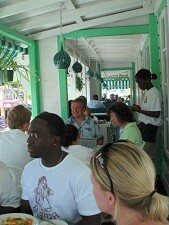 Hemingway’s – fun during the day and romantic in the evening – it’s special!